A Picture-Perfect Outing - Family Times is an award-winning magazine with staff-written news, feature stories and artwork that inform and inspire Central New York parents and their children. 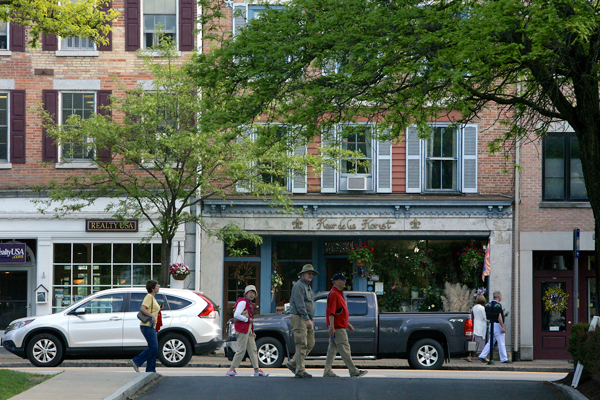 Skaneateles is so picture perfect, visitors stop mid-stride to admire this quaint storefront and that view of the lake. Visitors like Patrick and Dena Putrello of Utica angle their cell phone cameras, trying to get the best possible shot. “We love to go places with our grandchildren,” Patrick Putrello explained on a recent visit, “so we’re looking for things to do on a day trip.” As they found out, Skaneateles fit the bill. Just 23 miles west of Syracuse, the village curves along the north end of the lake that shares its name. 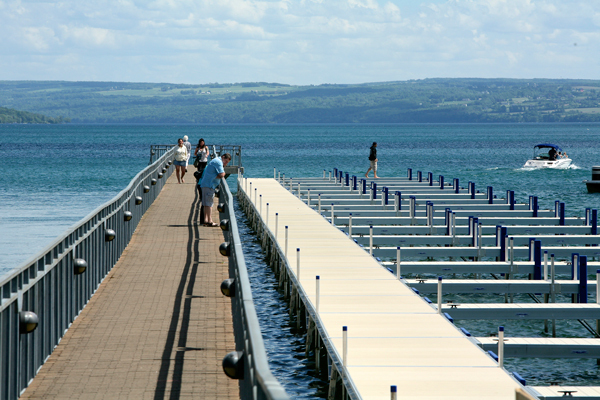 The fifth largest of the Finger Lakes, it’s the highest one, at 863 feet above sea level, and its remarkably clear waters often appear blue-green. 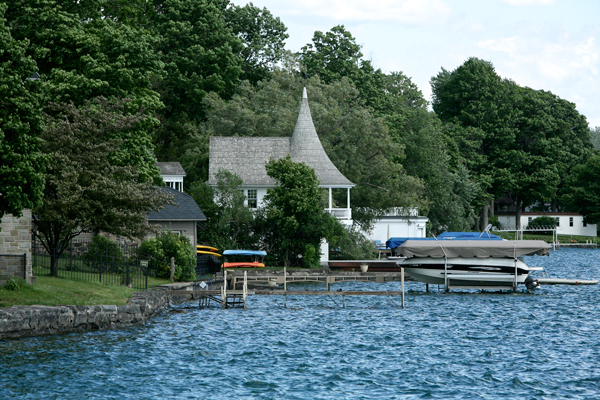 Skaneateles knows its lake views are special and worth preserving, thus green space bookends the commercial district: quiet Thayer Park to the east, busy Clift Park to the west. A long jetty just off the latter juts into the lake. Walk to Genesee Street, and turn right toward Clift Park, the hub of outdoor activities in the village, and you’ll see the gazebo, home to weekly concerts every Friday evening in July and August. The park’s green lawns angle down toward the lake; benches and shade trees invite you to sit and spread a blanket. The lakefront is unfenced and there’s a drop to the water’s surface, so keep an eye on little ones. In the summer, there’s public swimming when a lifeguard is on duty. No beach though. Instead, a set of stairs provides access to the lake. A nearby public restroom under the gazebo gives you a place to change and dry off. On the left side of Clift Park are docks for boats and a separate jetty, solidly fenced so that kids can safely peer down between the bars. Clift Park is also home to the Judge Ben Wiles, a tour boat operated by Mid-Lakes Navigation. From mid-May to the end of September, choose from sightseeing, lunch and dinner cruises from 50 minutes to three hours long (Gail at Mid-Lakes suggests the shorter sightseeing cruise for kids age 6 and under). You can also ride Spray, a U.S. Mailboat—one of the last remaining mailboats in the country—as it makes its three-hour delivery run. All cruises are narrated and offer special pricing for children under age 13. You can book online in advance. While there are no boat rentals at Clift Park, six miles down West Lake Road is Skaneateles Marina, which offers hourly, half-day or full-day rental for canoes, single and double kayaks, and paddle boards. Got a larger group? Try a pontoon boat rental; they discount rates on their 50-horsepower pontoons Mondays and Tuesdays. By now somebody’s stomach is rumbling. Two casual Skaneateles restaurants pride themselves on their child-friendly atmosphere. Right inside its front window, Johnny Angel’s has two tabletop wooden train sets and two wooden-bead roller coaster tables. Park your kids there while you order your meal at the counter. The kid’s menu has seven items, each with fries or applesauce and a fruit snack. On Wednesdays, every adult meal purchased earns a free kid’s meal. With high chairs, plastic bibs, a choice of coloring books and plenty of crayons, they’ve got everything covered. Known for its Heavenly Hamburgers, Johnny Angel’s also has entree salads, sandwiches, snacks and homemade soups. Another counter-service restaurant, Doug’s Fish Fry has a slightly more adult feel with its knotty-pine wainscoting and nautical décor. Yet kids will enjoy the large double-sided aquarium that divides the kitchen and dining area, and the overhead train set with a locomotive that chugs along railroad tracks suspended from the ceiling. A mural depicting Clift Park gives you plenty of “I Spy” possibilities, and Doug’s goes even artier with its own custom-designed coloring book. In good weather, head through the back door to Doug’s outdoor dining space. with picnic benches, umbrellas, flower boxes and vine-covered trellises. If you’d prefer a snack to a meal, steps away are two equally child friendly spots: Skaneateles Bakery and Skaneateles Skoops. The bakery’s seating area, although small, is wide enough to accommodate strollers. Choose from cookies, Rice Krispies treats, homemade raspberry pop-tarts, brownies, scones and muffins. Savory offerings include soups and sandwiches, including highly praised breakfast sandwiches. The yellow and blue exterior of Skaneateles Skoops (done in the high school’s colors) should make this ice cream shop stand out, but its hidden location—facing the municipal lot—is easy to miss from the street. Stop in for more than two dozen choices of Purity Ice Cream, made in Ithaca. For a more sophisticated dining experience, these spots elicit ooohs for ambiance and still offer kids’ portions. The Blue Water Grill has indoor and outdoor seating overlooking the pier, with burgers, tacos, sandwiches, steak and seafood and a four-item kids’ menu. Down the street, the stately charm of the Sherwood Inn makes it a memorable place for celebratory meals. The seven-item children’s menu includes grilled salmon and grilled steak, and two additional side salads are available. Directly behind the inn, Patisserie is a delightful trip to the Old World. Pick up a treat, take it outside to the wrought-iron tables and chairs, and enjoy a quiet moment in the shade of towering trees. Behind the register at Hobby House Toys, a young woman named Kerrie says she hears that a lot. The store excels at old-school playthings: green Army men, the classic red rubber ball, balloon-powered boats, Silly Putty and pop guns. It’s crammed with everything from classic board games, costumes, card games and 3,000-piece puzzles to higher-tech Snap Circuits and Laser Pegs. Young kids will be mesmerized by a child-height display of dozens of small inexpensive toys. In contrast, Pride + Joy is a spacious store that caters to infants, babies and moms with well-designed, fun and educational toys along with baby gear, clothing and gifts. From handmade bows and headbands by Fayetteville-based Sweet Priya to the oh-so-clever Happy Mat (featured on an episode of ABC’s Shark Tank), every item is carefully curated by the owners, two mothers with seven kids between them. 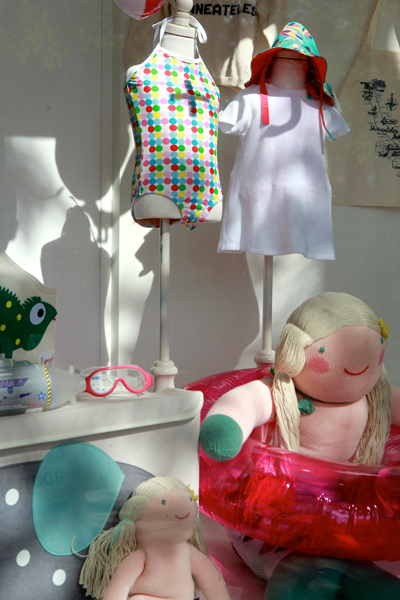 The aptly named Kinder Garden stocks toys that appeal to both parents and kids up through second grade. Prominently featured is Melissa & Doug, a brand that encourages free play and creativity. There’s also animal-themed rain gear with matching boots, slickers and umbrellas and Syracuse University clothing for infants and toddlers. A short drive away is the warehouse-style outlet store for German toy manufacturer HABA. Featuring a selection of German and European brands at 20 percent or more off retail prices, the outlet has well-crafted wooden toys, classic stuffed animals, clever play foods recreated in fabric instead of plastic, Götz dolls, and a line of elegantly designed diaper bags, blankets, bibs, children’s luggage and dishware. Other just-out-of-the-village spots are worth the drive. Stroll through fragrant fields at Lockwood Lavender Farm, where you can pick your own from June through August. Hike the former Skaneateles Short Line Railroad, now redeveloped as the Charlie Major Nature Trail, along which you’ll see ruins of factories and mills that once thrived along Skaneateles Creek. Enjoy classic American summer fare at Skan-Ellus Drive-In, including hot dogs, burgers, fresh haddock sandwiches and ice cream both hard and soft. Finally, if a day trip isn’t complete without some running, climbing and blowing-off-steam time, you’ll find two playgrounds: one at Austin Park, the other at State Street School. If you’re planning a visit, these annual events take place in July. The highlight of the Skaneateles Curbstone Festival and Sidewalk Sale (July 21 to 23) is the Duck Dash on July 22, when thousands of rubber ducks are released into Skaneateles Creek. The Finger Lakes Lavender Festival (July 9 and 10) at Lockwood Farm includes local artists and crafters and culinary delights. 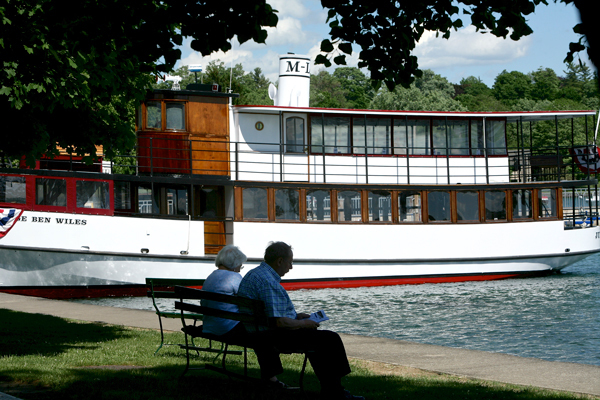 And the Skaneateles Antique and Classic Boat Show (July 29 to 31) features boats displayed on land and in the water, a classic boat parade, and children’s activities. 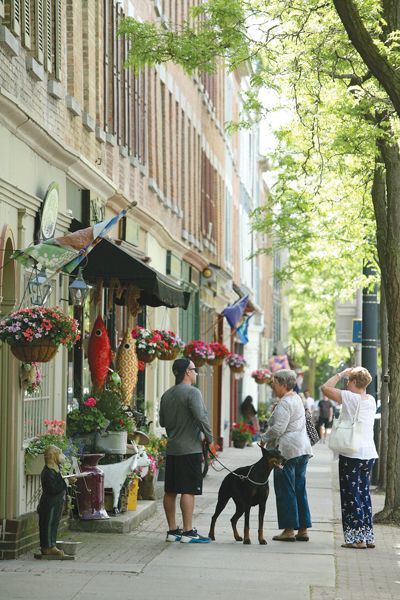 Skaneateles is a pocket-sized village that can be done in a day and still be enjoyed over a lifetime. It’s attracted a sitting U.S. president (Bill Clinton) for an end-of-summer vacation 17 years ago, a fact that proves why it’s better to be a Central New York resident than a U.S. president. From the White House it’s a six-hour drive at best. But for you, Skaneateles is right in your backyard. Between Jordan and State streets, one block from Route 20 (East Genesee Street). All-day parking permit, $2. Pay stations accept credit cards and coins. July and August, 11 a.m. to 7 p.m., when lifeguard is on duty. Free for residents, $2 for non-residents. Featuring the Skaneateles Community Band, at the Gazebo. 7:30 p.m. in July, 7 p.m. in August. Mid-Lakes Navigation, 11 Jordan St., Skaneateles. 685-8500. midlakesnav.com. Cruises depart hourly from noon to 6 p.m. Tours range from 50-minute sightseeing cruises ($16 per adult, $11 per child) to three-hour mailboat cruises ($27, adult, and $21, child). Skaneateles Marina, 1938 West Lake Road, Skaneateles. 685-5095. skanmarina.com. Single kayaks rent for $15 an hour, and double-kayaks and canoes cost $25 per hour. 22 Jordan St., Skaneateles. 685-0100. johnnyangels.biz. 8 Jordan St., Skaneateles. 685-3288. dougsfishfry.com. 19 Jordan St., Skaneateles. 685-3538. skaneatelesbakery.com. 22 Jordan St., Skaneateles. 283-1216. 4 Hannum St., Skaneateles. 685-2433. thesherwoodinn.com/patisserie. 1659 Cherry Valley Turnpike, Skaneateles. 685-8280. skanellusdrivein.com. 11 W. Genesee St., Skaneateles. 685-6600. bluewaterskaneateles.com. 26 W. Genesee St., Skaneateles. 685-3405. thesherwoodinn.com. 7 Jordan St., Skaneateles. 291-7012. 22 Jordan St., Skaneateles. 685-7576. prideandjoyshop.com. 3 E. Genesee St., Skaneateles. 685-2721. 4407 Jordan Road, Skaneateles. (800) 468-6873. habausa.com/outlet. 1682 West Lake Road, Skaneateles. 685-5369. lockwoodfarm.blogspot.com. Linda Lowen is a Syracuse-based freelance writer.